I created a short test song with Rob Papen Blue software synth. This synth sounds pretty good to me, creates me similar inspiration than the Access Virus b used to do when it was new. In addition to the Rob Papen blue, Apple loops and some other drum samples were used. DISCLAIMER: This track contains very heavy bass and is therefore best reproduced with audio system capable of reproducing the deepest notes. I have set high pass to 20 Hz, therefore it should not break a good subwoofer, but less capable sub can bottom with this track when played loud. I recommend playing this loud because this is the point. If your sub breaks, get a better one next time! The style is this time a bit like Vangelis. 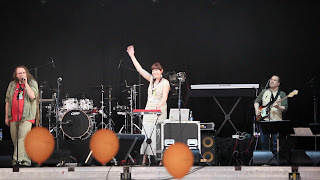 I played live yesterday. Here is a video of it. I played the Nord Modular live. being able to perhaps use it in Maemo Summit 2009 music video I am doing at the moment. 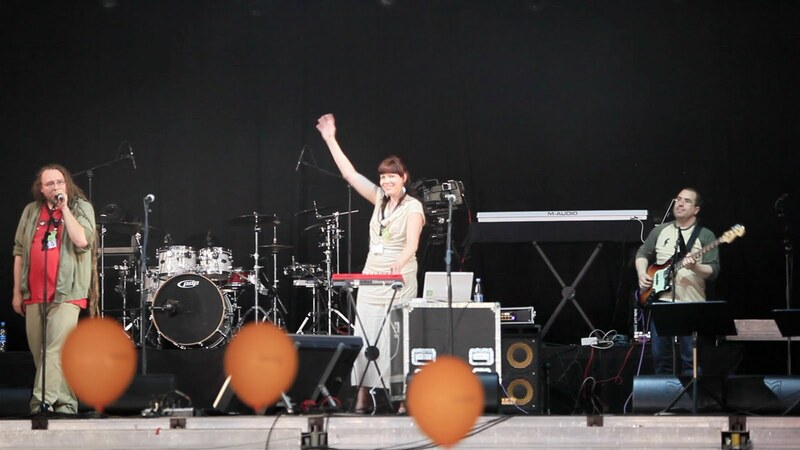 Here is a recording of Maemo Summit 2009 Opening sequence which features my music. This is not the final mix or may not have all the elements I might want to add and I may play again some parts which were poorly played. However, here is the preview. All comments are very welcome. Here is the download link to the file. This one is a lot louder and more energetic than the original mix. I added couple of new tracks into the mix as well. Enjoy! The song deserves to be played with a subwoofer and loud. You can imagine me playing this on the Borel Hill next to Silicon Valley (that was the idea I had when I was composing, the source of inspiration so to speak). Enjoy! You can place this song to your profile in Facebook by searching the song in the iLike Facebook app. "Close your eyes. Take a deep breath and drift away, drift away for couple of minutes. Imagine a trance party in top of the Borel Hill (next to Skyline Boulevard), near to Silicon Valley and San Francisco. You arrive at the party in a hybrid car Toyota Prius. There are couple of electric cars and hybrid cars parked on the parking place. You drive via the Skyline Boulevard and you see the altitude getting higher and higher. Pine trees go by on the sides of the road. You find a parking place with a superb view to Silicon Valley. You cross the road, follow the trail and climb up to the hill and join the party. You see to both Silicon Valley and to the Pacific ocean at the same time. It almost sunset and there are status clouds on top of Half Moon Bay (and Pacific Ocean). You can see these clouds from the top side and the red and orange colors of the sun setting down. The view is awesome. You look at the another direction. You can see the lights of San Francisco coming up, planes taking off and landing on San Francisco International airport, small planes landing on Palo Alto and San Carlos. 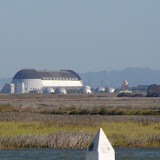 You can see also the enormous Moffett field building. Lights are coming up as the day darkens. Palo Alto and Mountain View are directly on front of you down when you look to the San Francisco Bay side. The grass-filled hill looks really beautiful in the sunset as the day is about to turn to night. You can see the marvellous colors and enjoy the view and enjoy the party. It is called a Sky Party!" These lyrics play in my head: "I am moving to San Francisco, where I am going to play in a disco..."
Just a quick experiment on the ambient side. 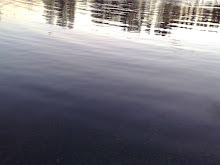 Ambient soundscape. - you are far away from Jupiter, approaching it on a trajectory which does not end up to a Jupiter orbit. Instead you are falling. There is nothing between you and the planet, and your speed is increasing and you can do nothing about it. And your headset pick the radiation interference as audio and you hear this thing. You fall between the clouds. Endless clouds in the huge atmosphere which feels like it never ends to a ground. Scary? Feel free to listen and have some ambient fun this time. This is very unusual to me, so please bear with me if it is not too perfect. I created a music video for the Symphonic Dream song. It features Kate flying Diamond DA42 Twin Star. I created new music video. It features Maemo Summit 2008 (Berlin, C-base) and the Catdroid song on the background. I created this today. Couple of hours of tinkering and this just happened. This is not ready, the melody is supposed sustain the two simultaneous melodies full length of the part B, but I haven't fixed yet just yet and wanted to share you an early preview what might be coming. What do you think? Feel free to give comments. Volumes may still need some adjustment and there are playing glitches there and there. So not final version just yet. Any comments about the current progress? I am quite proud how it sounds together! It utilizes some instruments from symphonic orchestra in addition to pure synthetic sounds. Here is another mix of the catdroid song. This has some elements changed and some extended. I am particularly happy with the intro section now. It has some ambient elements which fit with each other surprisingly well. Comments are welcome also, please give your opinion, which version you like the best. Here is another mix of the Catdroid. It is now a bit longer and the strings are removed from part A when it plays the first time (This is BABABABB). 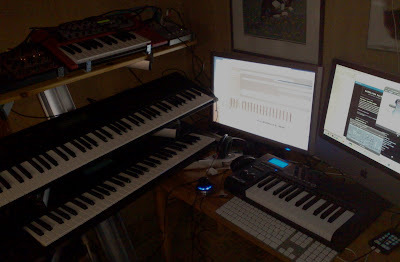 Equipment and software used: Apple iMac, Logic Studio, Novation V-synth, Soundtrack Pro, M-audio Axiom 25 as master keyboard. Track utilizes, as usual, my favorites: Tape delay and Space Designer effects. The Fairlight samples in the beginning were from Internet, all other sounds are from either Novation or from one of the software synthesizers in the Logic Studio. The studio gear nowadays fits to a very small space. This setup has Kate's Macbook, M-audio Axiom keyboard (which is USB powered) and the Mac runs Apple Logic Studio and also Novation V-Synth. At home I am using iMac. I no longer use the Wavestation or Roland D70 as a sound source very frequently, I rather use them as keyboard controllers. The Access Virus b I have is still quite useful instrument (although the Access Virus Snow costs the same as new now than the b-model costed used when we purchased it). Same applies for the Nord Modular (which I purchased from Fin (Christian Worton)). I have the Fin's patches still on it. I don't have the official editor for it for any of my operating systems though, but that is no problem, someone has done a open source editor for the NM and it works great on Mac and Linux. I don't usually have that much time to tinker with the sounds since I have so wide selection (many thousands) of presets available that I would be stupid to not use some of them - maybe edit a bit to suit my needs, but why to reinvent the wheel if someone has invented it already, I rather concentrate on making music nowadays. I really love the Logic Studio, it is propably my best software purchase I have ever made to the date. Excellent software with excellent add-ons. Everything is top-notch and as Apple products in usual, everything is also very nice... I would highly recommend Logic Studio if you are serious about producing music. I have tried demo-version of Abbleton Live and, tried Sonar longer time ago etc., but none of them are like the Logic. And now, when the Logic is an Apple product, the user interface has gone through some renewal, it is no longer like it used to be on PC "press middle button of the mouse on top of nowhere and use your nose to push CTRL at the same time while pressing some magic keys with your left hand". Now all the features are available for ordinary mortals like me. So how I like the Axiom? I read some praising reviews and some reviews where the reviewer totally disliked the keyboard. Based on my experience on different synth action -type keyboards (Korg, Roland, Nord etc. ), the M-Audio Axiom is not at all a bad one. Actually it has propably the best feel of all keyboards I have. 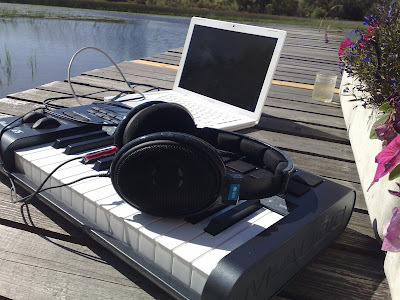 It only has 2 octaves on it, but for portability's sake, it is an acceptable compromise. I really like it. It is semi-weighted and it seems that some people don't like semi-weighted keyboards, but I like it very much and I can play very accurately with it. The Nord Modular's keyboard someone said to be good is quite crappy toy compared to this one, the Korg has sticky black keys, the Roland has pretty elegant action, but this one can be really used for serious playing and the semi-weighted feel is in my opinion great. The build quality is good and the price-value ratio is excellent. It does not have a metal case, but who cares, I don't want any steel case for something I am going to put in a backbag, this already weights quite a bit when combined with the Mac, but the studio is now movable, and usable - instead of studio being lots of gear disconnected in a storage room, this thing works and producing music is fun an easy - no cables, just one USB-cable and the headphone cable. Please notice that the link was changed from karoliinasalminen.com to katix.org since karoliinasalminen.com has been temporarily down. Redistributing the music downloaded through this page is allowed and encouraged. You are also okay to do remixes of my works as long as you share them with the same license. Playing on internet radios and FM radios is also allowed and encouraged. The music is royalty free, in other words, not registered by Teosto, Gramex and RIAA and you can play it anywhere to audience of any size with no royalties required. Copyright (C) 2008 Karoliina Salminen.